Jump Shot which requires you to obtain better height by jumping before finally letting go of the ball. Make sure that you do not out-jump your defender when doing this technique. If you want to become a more effective basketball player, coach or expert, then rest assured that Brainmeasures, an ISO certified skill testing and online certification company, can offer you a basketball certification course which works in further enhancing your knowledge about the sport. With the help of this basketball course, you will know more about the skills needed to become a more successful basketball player and the level of knowledge required to become a more effective basketball coaching expert. There is even a great chance that you will feel like you are taking up a more advanced basketball coaching course by enrolling in the basketball certification course from Brainmeasures. This online certification course makes it possible for you to enjoy a kind of basketball training which comes with the widest coverage so expect to be able to learn all the vital aspects of the sport. You will also be required to take the online basketball exam and successfully pass it before you can get your certificate as this test will serve as a more accurate assessment of your skills, knowledge and expertise in the field of basketball. 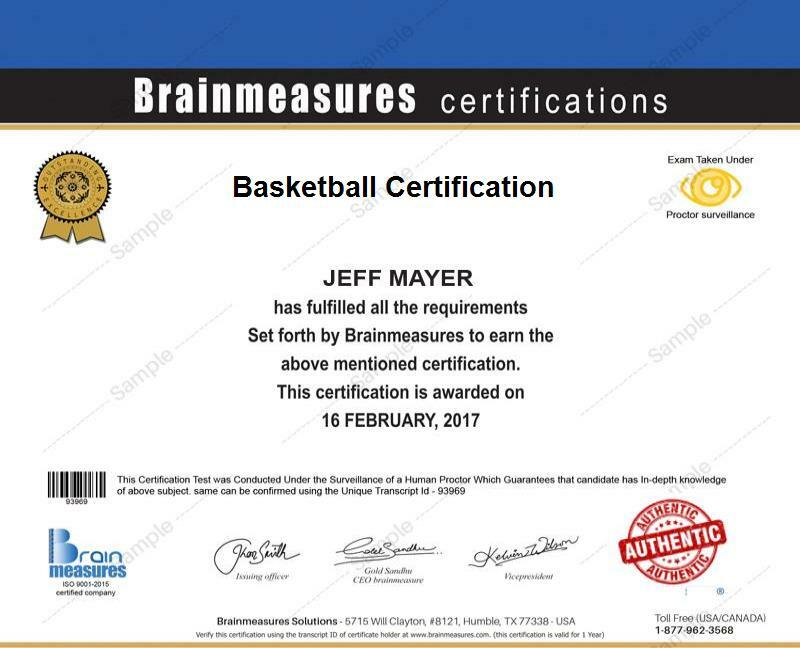 The basketball certification program which you can now access at Brainmeasures is perfectly suitable for those who strongly desire to become experts in the field of basketball. It works suitably for aspiring and existing basketball athletes, coach, coordinators and tutors who wish to gather information about the sport in order for them to successfully and effectively handle all their responsibilities. The basketball certification course also works for aspiring experts in the field of basketball who wish to know more about all the advanced techniques used in this sport. If you wish to complete a basketball certification course with an aim of becoming a basketball coach, then rest assured that this career is highly profitable. In fact, basketball certification holders who are still starting out in the field of coaching by providing their coaching services to elementary and high school students usually earn around $60,000 per year. If you work as a basketball coach in colleges and universities, then your earnings can grow to us much as two million to four million dollars per season. This amount can grow even more if you have already received an extensive experience in the field which makes you suitable for NBA players.